The University of New Mexico is marking 128 years of educating students in the Duke City with a one-of-a-kind art piece. Established on Feb. 28, 1889 the UNM student body is as diverse as the acres of desert landscape that surrounds its campus; and this year Lobo Day birthday party is focusing on celebrating the culture of contrast at UNM. Students, faculty and staff are invited to come help decorate the university’s birthday “present” – a four-foot by four-foot cube that, when unfolded, will create a mural highlighting the things that define UNM. The four walls of the wooden cube are actually smaller, standalone murals that create one larger image. The mural was designed by the University Communications and Marketing (UCAM) team, and portrays iconic campus scenes and symbols. UNM’s School of Architecture and Planning turned the idea of the mural cube into a reality. The wooden box was engraved in the Fabrication Lab; and all are welcome to make their mark on the structure using cherry, white, silver and black markers (provided at the event). The cube is a symbol of the strength created at UNM through unity and diversity. 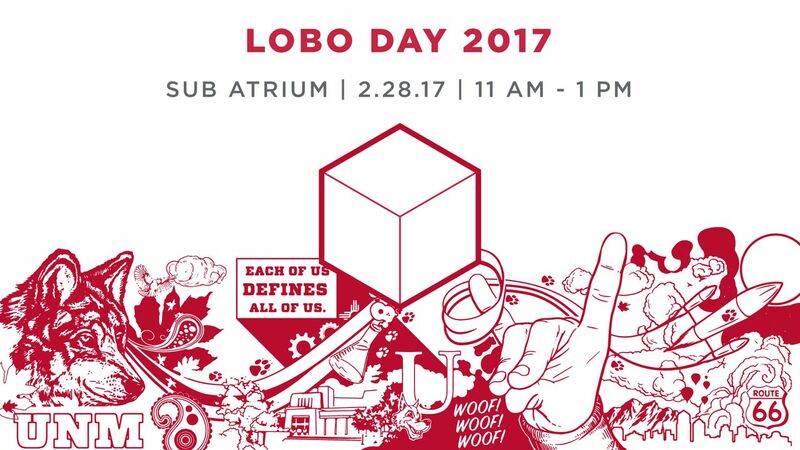 ASUNM Lobo Spirit, Student Activities and University Marketing and Communication are partnering to put on Lobo Day. Students will receive free t-shirts and there will be cake to mark the occasion. This year Lobo Day happens to fall on Fat Tuesday, the culmination of Mardi Gras celebrations, so there will also be king cake, beads and Mardi Gras decorations. Festivities and the cube decoration begin in the SUB Atrium Tuesday, Feb. 28 at 11 a.m. The official birthday photo will be taken at noon and the event will end around 1 p.m.